January 2013 – Next Hipster Trend is what's HAWT, NEXT! Put your shirt back on. No, seriously, put your shirt back on. Swimming is OVER. Look, I know it’s the middle of the summer but let’s face it … it’s impossible to look cool when you’re swimming. What kind of a loser slaps his stupid appendages against the water to remain buoyant? Wait!! Maybe it’s not over … perhaps you can accessorize! That’s the only chance of resurrecting this tired to-do. If you must swim, get yourself some water wings , or at the very least a paddle board. To be ironic you can paint it with a micro-mural of David Hasselhoff doing some Baywatch-style beach-running. Sweet idea! Damn, I’m amazing. 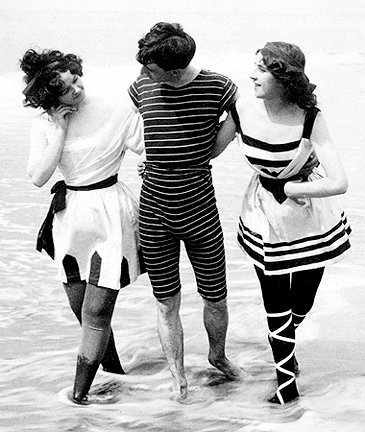 As we recommended only six days ago, 1920’s era swimwear is a must. Avoid Ken and Barbie-esque flippers and/or snorkel. Every normal has gone snorkeling by now and there’s nothing even remotely discussion-worthy in the sad, sad waters of your local lake in comparison to the ocean coral reefs that many normals have undoubtedly explored. The message here is simple. Try not to swim. If you can’t help your hipster self make sure that you are loaded for bear with all sorts of notice-me. Be sure to apply insane amounts of sunblock and talk for at least 37 minutes of the danger of UV rays while you’re out there. Wait!! Maybe it’s not over … perhaps you can accessorize! That’s the only chance of resurrecting this tired to-do. If you must swim, get yourself some water wings, or at the very least a paddle board. To be ironic you can paint it with a micro-mural of David Hasselhoff doing some Baywatch-style beach-running. Sweet idea! Damn, I’m amazing. As we recommended only six days ago, 1920’s era swimwear is a must. Avoid Ken and Barbie-esque flippers and/or snorkel. Every normal has gone snorkeling by now and there’s nothing even remotely discussion-worthy in the sad, sad waters of your local lake in comparison to the ocean coral reefs that many normals have undoubtedly explored.